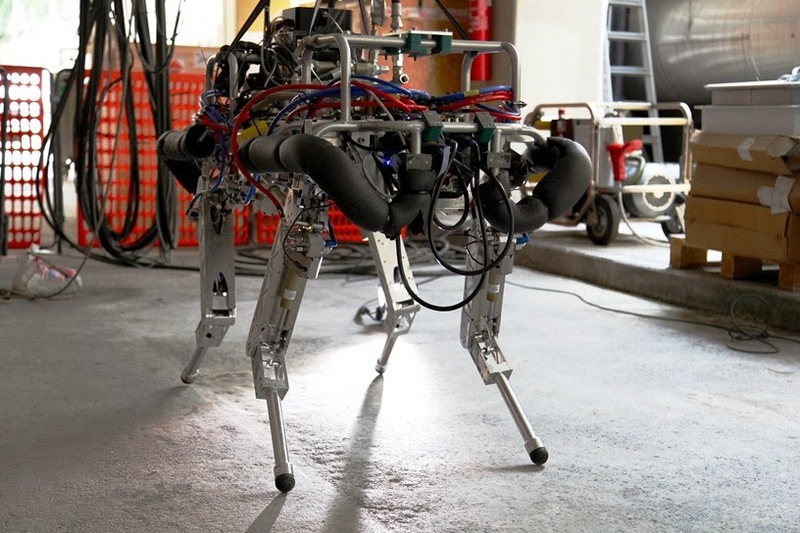 HyQ is the latest attention-getter in robotics, a torque-controlled robot that takes its name from its being a "Hydraulically actuated Quadruped." The robot is from the Department of Advanced Robotics at the Istituto Italiano di Tecnologia (Italian Institute of Technology or IIT). A video that demonstrates their progress includes notes that "there are no physical springs in the legs or body of HyQ; all compliance results from active adjustment of stiffness and damping by software." A detailed look at HyQ in Friday's IEEE Spectrum says that though HyQ was already introduced in the past, where its engineers taught the system some moves, a smarter HyQ is back "with even more tricks." Claudio Semini, the team leader, provided a history of their work on his web page, saying, "After extensive testing of a first leg prototype in 2008 and 2009, the first prototype of HyQ was operational in 2010. Since then, we have been gradually improving the robot hardware and software and we implemented several locomotion modes." Namely, the team has given HyQ the ability to move with more versatility and maintain greater autonomy. The quadruped can walk, trot, and run, and is showing a range of motion skills that make it possible to negotiate difficult conditions. HyQ motion skills include planned motion over uneven terrain to highly dynamic motions. Some highlights of the robot's skills are: walking over uneven terrain, balancing under disturbances, surviving being slammed into by a boxing bag, performing a flying trot, squat jump, and shows of adjustable stiffness and damping. IIT's project notes on the HyQ said that each leg features three degrees of freedom, two in the hip (abduction/adduction and flexion/extension) and one in the knee (flexion/extension). The leg is built of a light-weight aerospace-grade aluminium alloy and stainless steel. High resolution encoders and load cells in each joint allow a smooth control of position and torque. The researchers also presented a to-do list that will translate the robot's motion capabilities into practical applications. 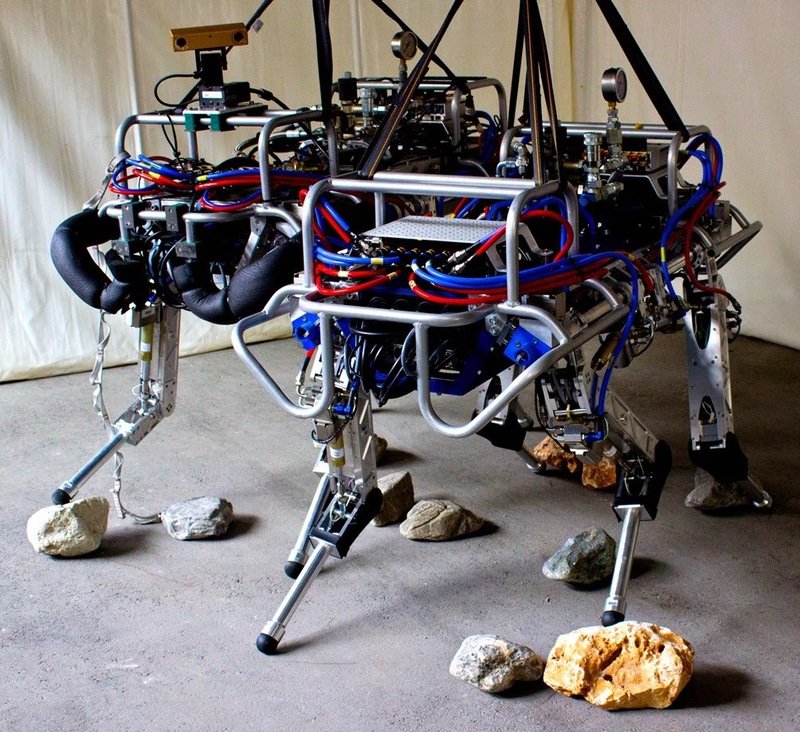 The HyQ team wants the robot to accomplish activities such as search and rescue, operating in contaminated areas, firefighting, and, for scientists, serving as an experimental platform for researchers exploring legged locomotion, biomechanics, force control and autonomous navigation. The IEEE Spectrum look at the HyQ also said it was worth pointing out that the HyQ was an open project, "with its creators publishing ample details about the robot's design, controllers, and operation."